Adrenaline enters the blood stream of a frightened deer, and is pumped into its muscles to enable them to quickly flee from danger. It is also assumed the sensitive nose of other deer that smell this urine detect a distress signal, which may result in setting off an alarm response to other deer that smell this urine. Pollick’s doe urine is collected only from tame, adult, bottle-fed doe, raised by hand from a few days old. This assures our hunters are getting the highest quality deer urine available. We also lightly freeze proof our deer urine with a modest amount of odorless glycerin before we bottle it. This allows more odor dispersal in cold weather and helps to retard spoilage. 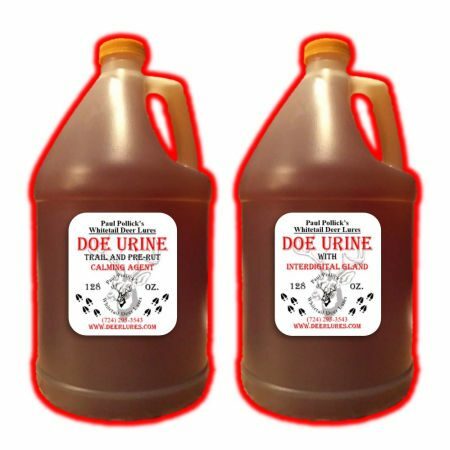 Our doe urine will perform with excellent results now and also next year if you haven’t used it yet. Plain doe urine is most effective during pre-rut, as buck begin to test doe urine for its sexual advertising scent phermones. Doe urine dispersed in a few areas around your stand on a dry limb or a few pieces of bark will assist in drawing the attention of other deer in the area. This also serves as a natural cover scent. We will add a pint ($36 value) of concentrated sexually mature Doe Interdigital Gland hoof musk scent pheromones for only $20 more to each gallon of Pollick’s regular Doe Urine. This makes a high interest, all season, natural trailing urine/gland scent both buck & doe will follow.